The happiness of Rachel Moos shone out clearly through the smile on her face as she left a conference room where dozens of priests and bishops were hearing confessions during the National Catholic Youth Conference (NCYC) held on Nov. 21-23 at the Indiana Convention Center and Lucas Oil Stadium in Indianapolis. “We were going to go to another [session], and it was full,” said Rachel, 16, of South Vienna, Ohio. “So I decided that I wanted to go to confession. Here was God giving me the chance. And it was a relief because I hadn’t gone since my first Communion. The joy that was the fruit of the sacrament of reconciliation at NCYC wasn’t experienced by the teenagers alone. Father Clement Davis, pastor of St. Bartholomew Parish in Columbus, drove an hour to Indianapolis to hear confessions on Nov. 22. 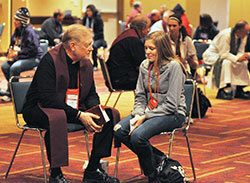 Bishop John B. Brungardt of the Diocese of Dodge City, Kan., signed up for six hours of confession during the conference. Luke Hassler, a seminarian for the Evansville Diocese and a junior at Bishop Simon Bruté College Seminary in Indianapolis, assisted conference participants in making their way to priests and bishops in the confession room. The regular flow of teens preparing to confess their sins encouraged him in his vocational discernment. The numbers of teens availing themselves to the sacrament of reconciliation during the conference was a help to Luke Santiago of Kualapuu, Hawaii. “I felt intimidated at first,” said Luke about the idea of going to confession. “But then it made me feel more comfortable because there were kids my age [going to confession]. The hushed conversations in the confession room stood in contrast to the singing, laughter and cheers that filled other conference rooms during NCYC. A similar quiet atmosphere pervaded a nearby chapel where a holy hour of eucharistic adoration took place on Nov. 22. Many teens who received sacramental absolution in confession made their way to the chapel, a converted conference room, where they prayed and did their penance. Devin Gutierrez of Dallas appreciated the quiet of the chapel. Wearing an “I’m forgiven” sticker, Rachel Moos reflected on how the outwardly intense general sessions in Lucas Oil Stadium flowed to the inwardly profound experience in confession. Having experienced the power of confession after being away from it for a number of years, Rachel said there was more to the numbers of teens at NCYC going to confession than just a form of positive peer pressure.